The Comeback 2017 Heisman Poll, Week 2: Has Bryce Love overtaken Saquon Barkley? Was Barkley hurt by Penn State's bye week? 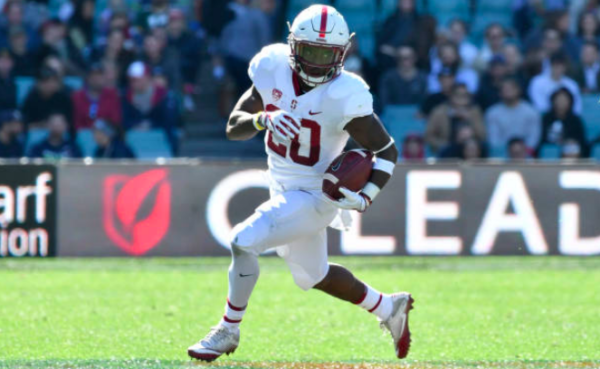 Last week, we debuted our Heisman poll with Penn State’s Saquon Barkley in the lead and Stanford’s Bryce Love following closely behind in second place. With Penn State idle last week, could Love or another contender like Rashaad Penny, Baker Mayfield, Lamar Jackson or Luke Falk make their move up the charts? A week of Top 10 upsets set the tone last weekend with Clemson, Washington, Washington State and Auburn all falling. Last week: 147 yards rushing on 17 carries (8.6 ypc) with 2 rushing TD. For the second straight week, Love racked up over 140 yards against one of the better run defenses in the country. No one else on this list has fared as well against top competition this year. Love was forced to leave the Oregon game a bit early with an injury, but his stats are still mind-boggling. There’s no one close to him in this race right now, but we’ll see what Barkley does against Michigan and Ohio State in the coming weeks. Love’s video game stats continued in Stanford’s destruction of Oregon last week. Love is simply the best player this year. Until somebody else proves they are better….he’s my choice. Season: 649 yards rushing on 102 carries (6.36 ypc) with 6 rushing TD. 29 receptions with 2 receiving TD. 1 for 1 passing for 16 yds and 1 TD. 1 kick-off return for TD. Even though he may have lost some steam the past few weeks, he is still the best and most productive all-around running back in the nation. His key make-or-break stretch begins this week against Michigan. With a bye, Barkley had a chance for his competition to fall back, but having a week off may have tightened the race. Of course, he’ll have plenty of opportunity to strengthen his case with Michigan, Ohio State and Michigan State lined up next. Good performances in those games might clinch the Heisman for him. But Bryce Love has definitely closed the gap, and surely overtaken Barkley on many ballots. Amidst the weekend carnage of top-ranked teams, Mayfield led Oklahoma to a gritty win over rival Texas one week after a shocking upset loss to Iowa State. Texas came at him with a great game plan, one that saw Baker toss his first pick of the season, but when it comes down to it, Mayfield looks to be slightly distancing himself as the grittiest leader at the sport’s most important position in 2017. – So far this season, the Heisman field is shallow. Only three players have garnered enough interest to truly be in the “hunt.” Bryce Love capitalized on Penn State’s off week and leaped over Saquon Barkley to take first place. Stanford is idle this week so with a good showing, Barkley is likely to take his spot back. Baker Mayfield remains within striking distance and has some big games on the horizon. – Taking a look deeper into the Heisman contenders, Mason Rudolph has a big chance this week. Rudolph leads the nation in passing yards per game and his Cowboys travel to Texas this week. – Jalen Hurts should keep rolling this week as his Tide host struggling Tennessee. Look for Hurts to put up some big numbers unless he is pulled early due to the mercy rule. – Lamar Jackson and Louisville have a big name game this weekend against Florida State. Unfortunately, both teams have under-performed this year as the Cards enter with a 4-3 record and the Noles are just 2-3 on the season. Despite the records, a big time performance against FSU would help Jackson get back towards the top of the contender pool. – Without a doubt, the biggest game is Penn State at Michigan. The Wolverines are currently sixth in the nation in run defense allowing just 85 yards per game. A win by Penn State would be huge for their national title hopes and for Barkely’s Heisman dreams. This may be a game where Barkely has to show off the other assets of his game like his receiving and kick return prowess. – Keep an eye on Jonathan Taylor (RB/Wisconsin). Taylor is just a freshman, but he is currently leading the Big Ten in rushing with 164 yards per game. That’s 58 more yards per game on the ground than Penn State’s Barkley. If Wisconsin keeps winning, look for Taylor’s name to start getting mentioned.